The U16 Girls travelled to Toronto play in the A/AA Division of the Hoop Dome Tournament. Friday had the Hurricanes start out slow against York South Silver Knights, falling behind 10 points, but with focused defense were able to take a six point lead by halftime. Lead by Riley Truax sit 12 points, Morgan Smith (8), Zoe Long (8) and with Jenna Yel’s 12 rebounds Huntsville ung on to win 39 – 27. The Huntsville squad was exceptional in sharing the basketball with 14 assists on 15 made field goals. 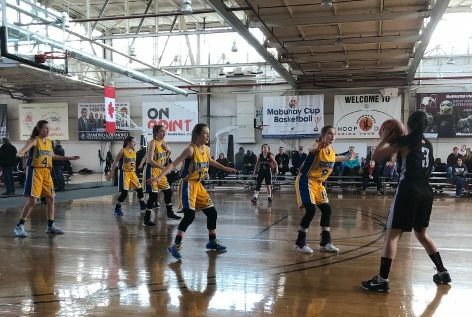 Saturday morning had the Hurricanes play the Picton County Clippers saw the Hurricanes take charge in a 13 – 4 second quarter on the way to a 51 -31 win. Truax lead the way with 32 points. Monique Boyko (7) was one of 5 other players chipping in points. With a win needed to advance to the medal round, Ottawa South was next on the schedule. It was a tight back and forth game with the Hurricanes prevailing 42 to 38 based on incredible team defense in the last three minutes. Truax (22), Jenna Yeo (7) and Boyko (6) lead the scoring. In the championship semi-final game against the team from IEM – Scarborough, the Hurricanes struggled against a stronger and quicker team that went on to win gold in the tournament. Long (9) lead the 7 of 9 players who scored in the game as Huntsville lost 50 – 30. The bronze medal game saw a re-match of the opening game of the tournament against the Silver Knights from York South. The Hurricanes came out with incredible intensity at both the offensive and defensive ends of the floor and jumped into a 26 to 6 lead. With all nine players scoring on a shooting percentage of 33% and making 73% of their foul shots the Hurricanes never let up playing hard and won a bronze medal with a 55 – 33 win. Next up is the Toronto Lords “AA” tournament on March 2 to 4.